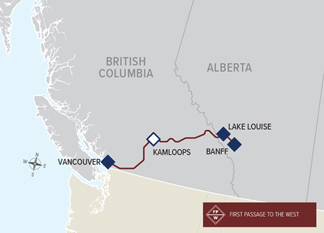 Although there is no train that travels between Vancouver and Calgary, you can take the Rocky Mountaineer train between Vancouver and Banff National Park. Calgary is 120 km or 86 miles from Banff and shuttles are available that travel between Calgary and Banff seven times daily. We are also happy to help with hotel suggestions, transportation and recommendations about things to see and do in Vancouver, Banff and Calgary. 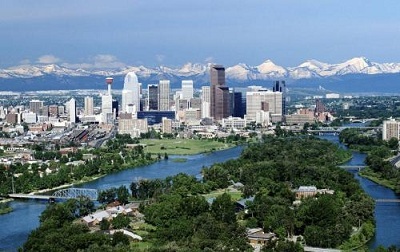 Or check-out our One-Way Tours that can start or end in Calgary. Call us at 800-913-9207 or 604-990-9299 or Email for more information and reservations. Whatever trip you choose, our service and the Rocky Mountaineer will exceed your expectations. Call 800-913-9207 or 604-990-9299 or Email for more information and prices. Prices are per person before taxes based on double occupancy. Check out departures to/from Jasper or Lake Louise here. GoldLeaf Service – Reserved seating in the GoldLeaf elevated dome car. Breakfast and lunch are served in the GoldLeaf dining car and GoldLeaf passengers have access to the outdoor viewing platform. Alcoholic and non-alcoholic beverages on the train and overnight accommodations are included in Kamloops.